“By intercession of Saint Blas, may God free you of your sore throat”, is the traditional prayer for the patron saint of the historic port in Nayarit. For centuries, Saint Blas was the patron of hunters, and the colorful celebrations taking place now invite people to be cheerful and to emit guacos, which is a yelp through which local fishermen express their joy. This old prayer is perfectly suited for a place with a privileged climate like San Blas, at the heart of Riviera Nayarit. Just like it’s been happening for decades, every February 3, San Blas celebrates its Patron Saint with a tradition that is breathtaking because of the fervor of its people, the colorful celebration and because of the originality of the local people. Activities begin in the wee hours of the morning, when they sing Las Mañanitas and celebrate Misa de Gallo, just like it happens everywhere else in Mexico. This marks the beginning of the dancing of the concheros, dressed in their typical attire based on the pre-Hispanic cultures, which concludes at 3 pm, when the image of Saint Blas is displayed at the atrium. The protector of the fishermen then exits the cave, making an analogy with the life of the real saint, who hid in the mountains to lead, cheer and help Christians during the Diocletianic Persecution. 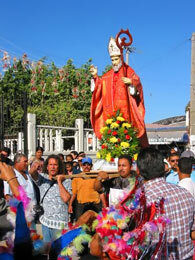 Saint Blas then leaves the church to bless the sea waters, so that the people of Nayarit can have a good fishing season, so that ships can sail calm seas, and so that prosperity can reach the fortified port. Initially, there is a procession from the church to the piers amidst chanting and prayers. There is already a ship waiting at the docks, which is especially adorned with flowers. One of the shrimp boats leads the fleet, which may include up to 50 ships, ranging from the huge fishing boats to the tiniest vessels, which are offered to the pilgrims at no cost, so that they may continue their journey at sea. Once they’re on open waters, prayers continue while priests bless an ocean that has bestowed its natural wealth to the local population. The devotion continues with a traditional mass on the beach, and then the procession heads back to the church. Once the Saint is back home, the joy reaches its climax, while fireworks fill the night sky and the loud bangs continue for over an hour. This is a celebration that invites to sing and shout until everyone gets a sore throat, so it’s a good idea to entrust oneself to the Saint’s specialty. This celebration is upon us, so: “By intercession of San Blas, may God free you of your sore throat”. If you’re planning to participate in the celebration, it’s worth spending a few days to enjoy the festivities in honor of priest Jose Maria Mercado, one of the bravest fighters of the Independence. His greatest achievement was to take the square of Tepic and San Blas in Nayarit without making a single shot. During the celebration, the military bands of several local schools compete in a parade that goes from the town square to the Contaduria, a fort where commerce used to take place in Colonial times.